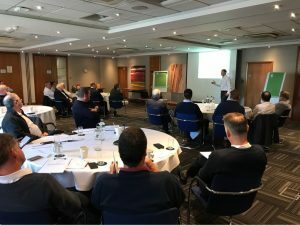 Many thanks to the 30+ people who attended the ‘Risk Assessing The Risk Assessor’ seminar in High Wycombe on 5th October. The interaction and debate is always a highlight and I appreciate the feedback. Thoroughly enjoyed the presentation, relaxed enjoyable atmosphere and the choice of venue was also very good. It was very good – many thanks! Really good to have the lawyer’s perspective on this subject matter. I had a lot of this covered but the relative importance and legal logic has been very helpful so that I can improve my own T&C’s and view these things from a more knowledgeable perspective. Very enjoyable and informative. Very well and clearly delivered given the subject and audience. Venue was good, location, access and parking. Speaker took questions and offered helpful debate.